With a shared dedication to hand surgery, our group of four board certified orthopedic surgeons specializes in problems involving the hand, wrist and forearm. Hand surgeons are specially trained to diagnose your hand condition and to recommend appropriate treatment options – often with no surgery required. Our physicians are also on the staff of both Evergreen and Overlake Hospital and work closely with hand therapists in the rehabilitation of injuries. 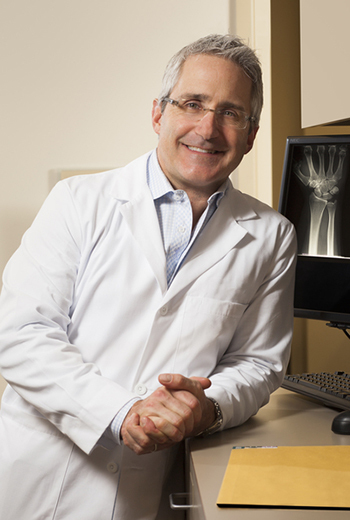 Dr. Anderson’s approach to the care of the hands and upper extremities is patient-centered. Through his years of experience he has learned that the best care involves patients in the treatment process and makes them an essential part of the care team. Dr. Anderson graduated with honors from the University of Arizona Medical School. He was also selected as a member of Alpha Omega Alpha, the national medical student honor society. Dr. Anderson completed his orthopedic residency at the University of California Davis Medical Center, a prominent orthopedic training facility. He undertook further advanced medical training at the Indiana Hand to Shoulder Center in Indianapolis, nationally recognized for its innovative treatments of the hand and upper extremities. Dr. Anderson joins Proliance Hand, Wrist and Elbow Physicians from Eastern Washington, where he practiced for years as a successful orthopedic surgeon. During this time he achieved board certification as a Diplomat of the American Board of Orthopaedic Surgery and earned the Certification of Added Qualification in Hand Surgery. Committed to training others in his field, Dr. Anderson has authored numerous articles and book chapters and teaches when his schedule permits at the University of Washington. Dr. Anderson is a member of the American Society for Surgery of the Hand and a fellow of the American Academy of Orthopaedic Surgeons. Besides treating patients at PHWE, Dr. Anderson is an active physician and surgeon at Overlake Hospital Medical Center, Evergreen Hospital Medical Center, and Swedish Medical Center. In addition to his interest in the care of the hand, Dr. Anderson has advanced training in problems affecting the elbow. He has a particular interest in conditions which cause pain or disability in the elbow, such as trauma, fractures, or arthritis. Clinical Focus: hand and wrist surgery, trauma and problem fractures, injuries of the elbow and elbow surgery, including elbow arthroscopy, and workers compensation. Dr. Beck’s philosophy of patient care is one that was cultivated during his residency and fellowship training. He believes in a shared effort with patients, families and other health care providers to create the best treatment course and maximize results for each patient. Dr. Beck received his undergraduate education from the University of Notre Dame and his medical degree from University of Washington School of Medicine in Seattle. He completed his residency in orthopaedic surgery at Geisinger Medical Center, a level one trauma center serving Central Pennsylvania. Dr. Beck received further subspecialty training in a Hand and Upper Extremity Fellowship at University of California Irvine, which included a focus in microsurgery, complex hand and wrist trauma and reconstruction. He is an active contributor to the orthopaedic field, publishing many research articles, authoring orthopaedic text book chapters and presenting research at both national and international meetings. 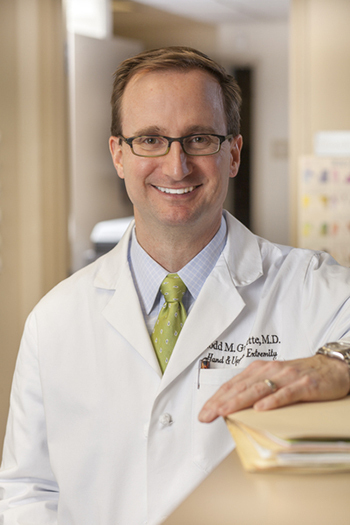 Dr. Beck is board certified for the American Board of Orthopaedic Surgery. He is a member of the American Society of Surgery for the Hand and the American Academy of Orthopaedic Surgeons. He is an affiliate physician with Overlake Hospital Medical Center, Evergreen Hospital Medical Center and Swedish Medical Center. 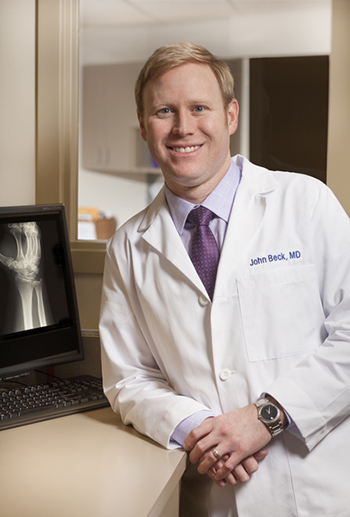 In addition to the surgeries of the hand, Dr. Beck focuses his practice on complex elbow surgery. Clinical Focus: Surgical and non-surgical treatment of the hand, wrist, and elbow, complex hand, wrist and elbow trauma, arthritis of the hand and wrist, nerve compression of the upper extremity, wrist arthroscopy, endoscopic carpal tunnel and endoscopic cubital tunnel release, contractures of the hand and wrist. Dr. Guyette’s years in practice has solidified his patient philosophy, that the localized problems of the upper extremity affect the whole patient – their work, recreational activities, and even simple daily tasks – and their treatment must be undertaken in that context. Dr. Guyette graduated Salutorian from the University of Southern California. After earning his M.D. degree from Harvard Medical School, he completed his residency in Orthopedic Surgery at the Hospital for Special Surgery in New York City; the oldest orthopedic surgery hospital in the United States consistently ranked #1 in Orthopedics. His advanced training in Hand and Microsurgery was undertaken at the Curtis National Hand Center in Baltimore, MD, the largest hand surgery center in the world. From this strong academic background Dr. Guyette has published numerous articles and book chapters, and continues to teach in the academic community as a lecturer at the University of Washington, local hospitals and private symposiums. Dr. Guyette is board-certified as a Diplomat of the American Board of Orthopedic Surgery and has a Certification of Added Qualifications in Hand Surgery. With a clinical practice that spans the range of upper extremity pathology, Dr. Guyette is a member of the American Academy of Orthopedic Surgery and the American Society of Surgery of the Hand. He is also an active physician with Overlake Hospital Medical Center, Evergreen Hospital Medical Center, and Swedish Medical Center. With a clinical practice that spans the range of upper extremity pathology, Dr. Guyette has advanced training and interest in the newest techniques for hand and upper extremity pathology. Yet surgery remains only one pillar of treatment, many of these diagnoses can be successfully managed without surgery with a coordinated approach including therapy, medications, and patient education. Dr. Guyette was recognized as the top hand surgeon from both Seattle Magazine and Seattle Met Magazine for 2014/2015, the only Eastside hand surgeon with that honor. Clinical Focus: Surgical and nonsurgical treatment of complex hand and wrist trauma, nerve compression syndromes of the upper extremity with minimally invasive endoscopic techniques, wrist and digit arthroscopy, arthritis of the hand and wrist, Dupuytren’s contracture, skin and soft tissue problems. Dr. Sun’s philosophy of patient care has evolved from his medical training, his years in practice, and his personal experiences. His goal is to inform and educate patients on their specific problems and then to provide treatments tailored to each patient’s unique health situation. He believes that the decision to proceed with surgical vs. non-surgical treatment is best determined by considering the whole patient, not just his or her particular medical condition. Dr. Sun completed his undergraduate studies in engineering at Northwestern University and afterward worked in systems consulting. Gravitating to medicine, he obtained master’s degrees in neurobiology and physiology at Northwestern University and then attended Rush Medical College in Chicago. Dr. Sun completed his orthopedic surgery training at the University of Miami in Florida, which comprises the third largest hospital system in the United States and serves as the only Level 1 trauma center for southern Florida. From there Dr. Sun went to the University of Washington for a hand-and-upper-extremity fellowship, giving him an opportunity to further his training in trauma and complex reconstructive procedures. Dr. Sun is board-certified as a Diplomat of the American Board of Orthopedic Surgery and has a Certification of Added Qualifications in Hand Surgery. He is also an affiliated physician with Evergreen Hospital Medical Center and Overlake Hospital Medical Center. 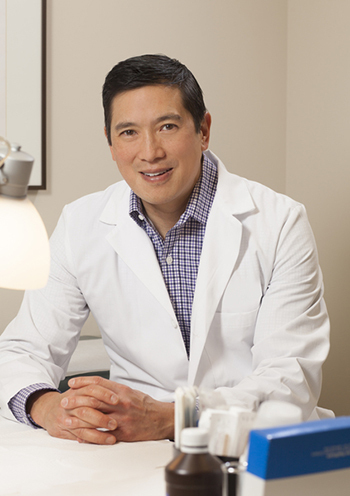 Dr. Sun has been recognized by Seattle Met Magazine and Seattle Magazine as a top hand surgeon in the Seattle metro area. Clinical Focus: Hand and wrist surgery, covering a broad range of clinical problems such as trauma (fractures, ligament injuries, tendon and nerve injuries), nerve compression (for example, carpal tunnel syndrome), arthritis, and skin and soft tissue problems (for example, Dupuytren’s disease).